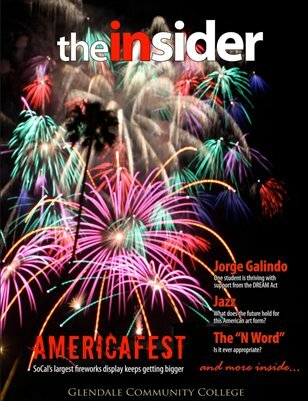 This year’s offerings include everything from profiles of notable students, the controversy of gluten free diets, fireworks, the future of jazz music, whether it has become acceptable to use the “n word” and a review of Glendale’s newest entertainment complex, the MGN 5 Star Cinema. Best of all, Glendale College’s Year in Pictures is featured in the center spread. In short, there is something for every reader in Glendale College’s student magazine. Enjoy!